Sadly, Reverend Obertask hasn’t got much experience of curses and though he’s good at listening, he’s somewhat out of his depth when it comes to Louisiana’s multiple predicaments. Her Granny, who has always cared for her, had insisted they set out together on a road trip. But now she’s taken the car and left Louisiana stranded in Richford, Georgia at the Good Night, Sleep Tight Motel, with no money for the room or her next meal. Louisiana’s missing her Florida home, Archie, King of Cats, Buddy the one-eyed dog, and best friends Beverly Tapinski and Raymie Clarke – a.k.a. 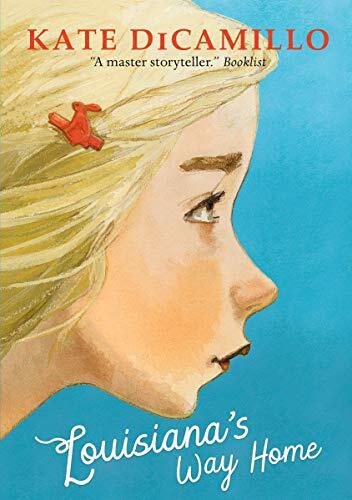 Raymie Nightingale, a name familiar to countless Kate DiCamillo fans as the title of her 2016 New York Times bestseller. That novel introduced us to Louisiana and her friends, recording among many other notable incidents, her 1975 coronation as Little Miss Central Florida Tire, a title enhanced by a prize of $1975.00. Here, we’re a couple of years on from that triumph, and quite definitely not in our own world, noisy with mobile phones, vacuous tweets, video games et al. 1977 Richford, Georgia, stands somewhere outside time in the Deep South, a place where language is used, as a matter of course, with respect and relish. Maybe a place that never was. Louisiana’s narrative, especially the conversations with those she meets, young and old, is sharply detailed in both thought and word. Her voice, we might infer, has been learned from her Granny; occasionally, both are inclined to aphorism. As in Raymie Nightingale, the story encompasses sadness and humour, vulnerability and strength, loss and finding. Granny’s own melancholy history emerges in a loving letter she leaves back at the motel for Louisiana. Her most startling revelation is that she is not Louisiana’s Granny at all. She had found baby Louisiana abandoned in a back alley, taken her in and for ever after loved her with all her quirky being. Her earliest days, it seems, were very like Louisiana’s and now, with the end of life not too far away, she feels compelled to probe the mysteries of her origins back in Elf Ear, Nebraska. So she drives away, trusting that Louisiana’s resilience will see her through; which indeed it does, with the help of the good folk of Richford. Louisiana’s account of events (we discover towards the story’s end) is addressed to her Granny; it’s a message of understanding and forgiveness. DiCamillo’s talent is to explore the acute pain of childhood loneliness through her narrator’s unselfconscious comic perspective. Louisiana’s storytelling has an apparent simplicity, yet the quaint precision of her words invites young – and adult - readers to share a pleasure in language with both narrator and author. For those young readers with an ear to hear, that’s an unusual delight.